Now your ‘one stop shop’ on the Westside! 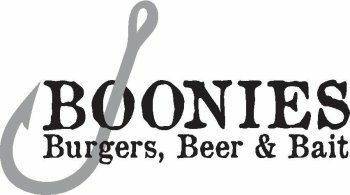 Boonies is open Fridays at 5pm and Saturdays & Sundays we open at noon. Dine on fresh seafood, signature appetizers, soups, salads, juicy burgers, and 'build your own' hand-tossed pizza. Bring the whole family and enjoy dinner and cocktails. Live music on the deck every weekend. It's well worth the drive. The newly added retail store offers beer, wine & spirits, as well as a bait & tackle shop! If you’re heading out on the water, stop by for fishing supplies, cold drinks and delicious carry-out! Come see us this weekend! Take a look at some of the delicous food served at Boonies! The casual atmosphere and quaint setting are perfect for kicking back with a burger and a beer! Come see for yourself what Boonies has to offer! Boonies isn't just "Burgers, Beer & Bait"... we offer a full menu of appetizers, soups, seafood entrees, salads, hand-tossed pizzas, creative sandwiches and more! Hand-crafted cocktails, assorted beer and wine keep the grown-ups happy! Interested in planning a group event at Boonies? Get in touch with us today! Looking for employment opportunities? Send us your resume! We look forward to hearing from you!